Twenty-five years ago saw the last game of the USFL - a league given no shot against the NFL's monopoly, but beloved to this day for the rebellious challenge it posed. Today, similarly pitted against the Madden monolith, comes Backbreaker. Video game or sport, no amount of nostalgia or John Facenda verbiage will by itself make something a legitimate contender. It still has to line up and deliver on the terms commonly expected by the sporting public. Backbreaker faces two brutally difficult tests - is it different enough from the establishment to be better? And is it familiar enough to the mainstream to be accepted? The Hits Keep Coming: This is meant to be football from the perspective of a player, not a broadcaster (there aren't even any announcers in the game, except for the stadium P.A.) Although not a true third-person camera, I enjoyed Backbreaker's novel perspective, which puts you in control of one player, action-game style. It takes some getting used to, but it makes playing defense, especially in the secondary, fun even for a novice. (As Luke puts it, when you lay on the right trigger sprint modifier, it's like playing football with Gears of War's roadie run). Switching defenders can be a crapshoot and passing is a lot harder than in a game like Madden. From the QB perspective, the game doesn't give you much opportunity to go through more than two options. But unlike gimmicky first-person attempts in past sports games, this one's still playable and very fun. Control Box: Backbreaker joins the sports design trend of placing emphasis on the right analog stick. It's everything from your swim/rip move on defense, to your bonecrunching hit or tackle, to juking, spinning, selecting receivers and passing. You use the right trigger as an action modifier ("aggressive mode") to go into other areas of your player's toolset. Everything is contextual to the type of player you control and it's pick-up-and-play intuitive after one trip through the tutorial. There is only one complaint, but it's a biggie: The lob pass. It simply does not work as described in the tutorial or the instruction manual and is functionally impossible to execute in a live game. Don't bother with it unless you're trying for the tutorial achievement. Football in the Future: NaturalMotion shrewdly constructed a quasi-futuristic football world - say, set maybe 30 years in the future - to help it shed inevitable reminders that it's not a licensed football game. Players wear a uniform that resembles a type of combat armor, everyone has a shaded visor and a microphone headset. The stadiums are a joy to look at when you can steal a glance. Visually, the game lays a great foundation for the story of a league and a team that you'll end up telling, through both your play and the game's mind-bogglingly deep team creation tools. A Mess of Multiplayer: Backbreaker absolutely flunks in online play. Lag is totally crippling for those not hosting a game - to the point I thought I'd intercepted a pass and ran all the way to my end zone before realizing my opponent had scored. Hosting a game there is no lag, but your opponent will feel it, so be prepared for a lot of quits. It's just not something you'll want to take online more than once. Shallow Singleplayer: Unfortunately, singleplayer games are not a particularly deep experience after about half a dozen games. The playbook is uniform to all teams and runs about 100 on offense and defense. You get four audibles on offense and defense and a basic flip-play command that inverts the formation. I did not observe any injuries or fatigue in the game, making me wonder why the teams need depth charts beyond the fifth defensive back or receiver.. The AI is easy to beat at all levels of difficulty, even with the worst teams if you play conservative and blitz a lot. It'll chuck a lot of incompletions and interceptions, and won't react to what you do pre-snap, including parking the free safety on the line of scrimmage. In all, Backbreaker serves up a decidedly last-generation package of game-management features, which wouldn't even be state of the art in 2004. Pointless Penalties: Be prepared for your defensive line to get the yips and break off four or six unprovoked offsides (this seems more common to multiplayer than singleplayer). It seems to be one penalty the game is capable of accurately calling. You can stand a defensive lineman straight up in the neutral zone before the snap, with no flag thrown. The game delights in flagging roughing the passer, some of which are just unavoidable. But my punter got knocked to the ground three times in a game with zero penalty called. The game doesn't show much understanding of the more subtle variances on pro football's rules - an incomplete pass behind the line of scrimmage is going to wind up a fumble, and running backs coming of the backfield on a receiving route can be mugged with no pass interference consequences. You just have to try to avoid these situations. Madden alternatives get graded on a curve, because it takes a lot of courage to go up against that game without an NFL license; because gamers resent being forced into one option for any category; and because they've nursed a grudge over that franchise's exclusive NFL deal for more than six years. But those hoping Backbreaker is a spiritual heir to NFL 2K5 or a righteous middle finger to EA Sports will be disappointed. There are parts of this game I do want to see in a full-featured NFL title, especially the playing perspective and the rollicking violence on field. Dragging a defender the last 10 yards of a kickoff return touchdown run is one of my all time football gaming highlights, without a doubt. Still, given the shameful quality of its multiplayer support, there's not enough else in Backbreaker's no-frills singleplayer experience to make it more than an off-season exhibition, like the Ohio State spring game. NaturalMotion definitely demonstrated that the Euphoria engine belongs in sports gaming. But it didn't show that Backbreaker belongs with it. 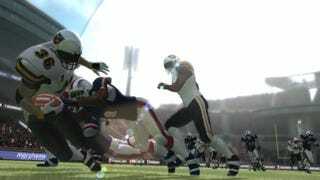 Backbreaker was developed by NaturalMotion Games and published by 505 Games for the Xbox 360 and PS3 on June 1. Retails for $49.99 USD. A copy of the game was given to us by the publisher for reviewing purposes. Played all game types in both single and multiplayer modes.